A mural project and public garden space are adding a new dimension of growth to evolving town-gown relations in Poughkeepsie. Vassar students teamed up with a local elementary school to create a community mural and garden on Raymond Avenue, in Vassar’s neighboring Arlington district. 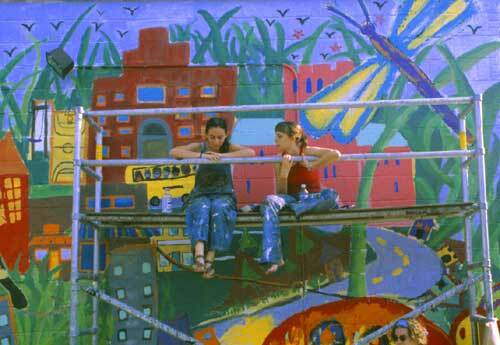 The mural was designed by Vassar students Rosa Kessler ’03 (pictured above, left) and Hillary Angelo ’03 based on drawings completed by kindergarten through fifth-graders at Arthur S. May Elementary. 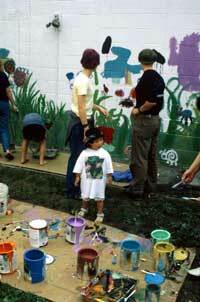 Painting was ongoing and open to all volunteers every Saturday in September. It concluded at the September 22 Arlington Street Fair, where painters ranging in age from 3 to 70 worked on the project together. The Arlington Street Fair is an annual event that began three years ago as a combined effort of the Arlington Business Association, Vassar College, and the Vassar Student Association. Collegeview and Raymond Avenues are blocked off for the day. Dozens of vendors and clubs offer sidewalk sales, food, crafts, and information; Vassar’s Office of Athletics sponsors coaching clinics on the Alumnae House lawn; kids’ activities are held at Arthur S. May Elementary; and a live entertainment stage features the likes of the Vassar Night Owls and Pete Seeger. The mural was sponsored by BIG ART, a program coordinated by Sam Speers, director of the Office of Religious and Spiritual Life, that focuses on large-scale public art projects as a medium for exploring community and social change. BIG ART’s unofficial motto is, "when we make things together, we discover that together we can make things change," according to Speers. The creation of the mural illustrates this motto perfectly. Plans are not stopping any time soon — in the future, the students hope to convert the vacant lot adjacent to the mural (which is owned by Vassar) into a usable green space for college and community events. "We envision a raised-bed garden with open spaces and sculpture installations," Angelo said. "Both the theme of the mural itself and the eventual use of the space will, we hope, serve as inspiring and enduring reminders of the sustained need for vision, growth, communication, and the arts, for our communities and ourselves."